Distinctive features: One of the first calculators with a Liquid Crystal Display (LCD). Display is 8 digits, reflective Liquid Crystal Display (LCD), which is illuminated by a filament lamp. 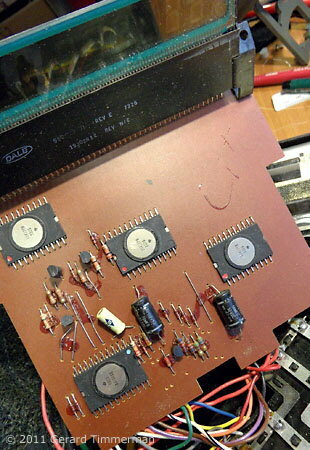 The circuit board carries 3 Large-scale integrated circuits manufactured by Rockwell (two type 10417PB and a 15311P), and in the machine ilustrated are date coded to early-1973. 165 x 276 x 80mm / 6.5x10.9x3.1". Rapid Data Systems & Equipment Ltd., of Ontario.Canada. Assembled in Mexico primarily of United States parts. 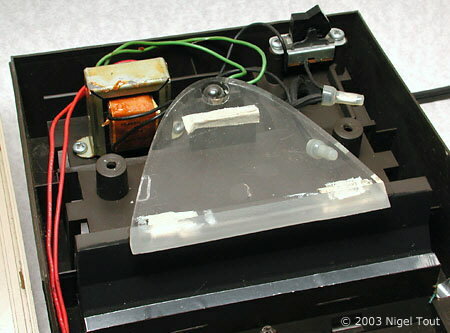 The cover has been removed to show the half-elliptical plastic light guide which projects light at a glancing angle across the LCD. The filament lamp is at the rounded end of the light guide. 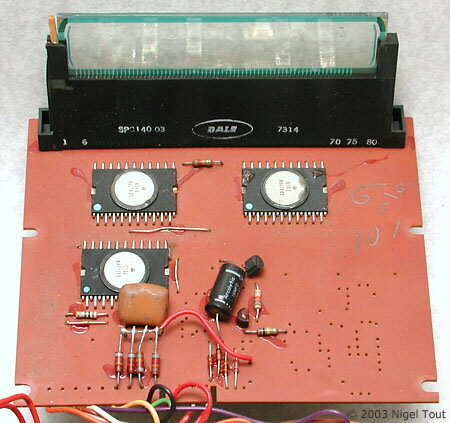 The circuit board with the three Rockwell integrated circuits and the LCD. The LCD is clear when unenergised and in the calculator is mounted against a black background. When segments of a digit are energised they turn shiny metallic, unlike modern LCDs which turn black. 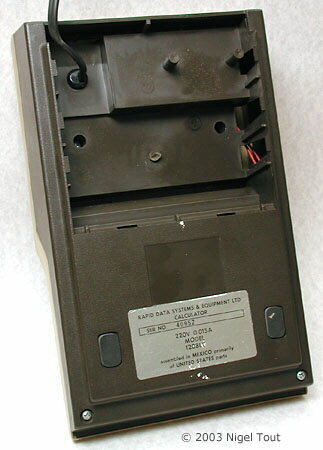 The rear of the calculator with a cover slid off to reveal a large space which could be used to hold batteries in a hand-held version. Compare this machine with the Lloyds Accumatic 100, which is a slightly smaller hand-held version. This is one of the models based on Rockwell electronics and LCDs which were the first LCD calculators. 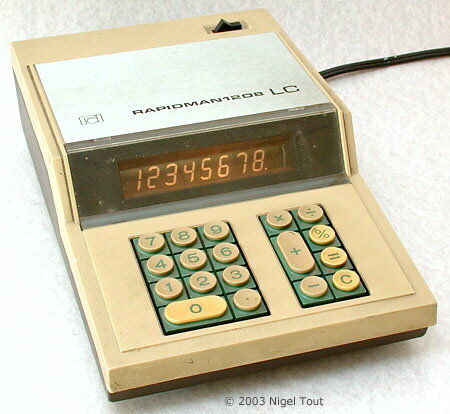 Similar calculators appeared under the Lloyds and Sears labels, and hand-held versions were also produced, such as the Lloyds Accumatic 100 which is very similar to this model. Technical details:Display is 12 digits, reflective LCD (Liquid Crystal Display), which is illuminated by a fluorescent tube. In this example the left-hand half of the display is damaged and not working. 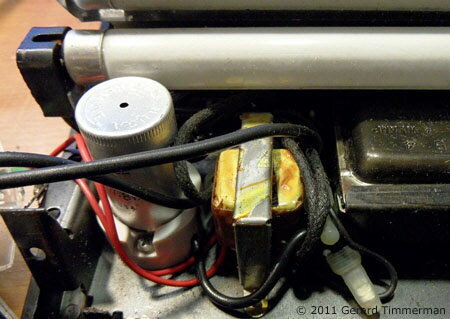 The circuit board in this model carries 4 Large-scale integrated circuits manufactured by Rockwell (three type 10417PB and a 15361PB), and in the machine illustrated are date coded to mid-1973. Sears, Roebuck & CO., Chicago, Ill, U.S.A.
Photographs kindly supplied by Gerard Timmerman. Highly unusually, the backlight is a fluorescent tube running directly off the 110V supply with a regular starter and ballast. The circuit board showing the four Rockwell integrated circuits. Rockwell manufactured these models. "Assembled in Mexico" was standard for Rockwell calculators of this period. The journal Electronics Illustrated of September 1972 reported: "Electronics division of North American Rockwell Corp. (NRMEC) will start delivering electronic mini-calculators this June to Sears Roebuck, Lloyds of California and other consumer outlets. Machines will be sold under customer labels, but are based on advances made recently by NRMEC in liquid-crystal technology and large-scale integrated circuits." 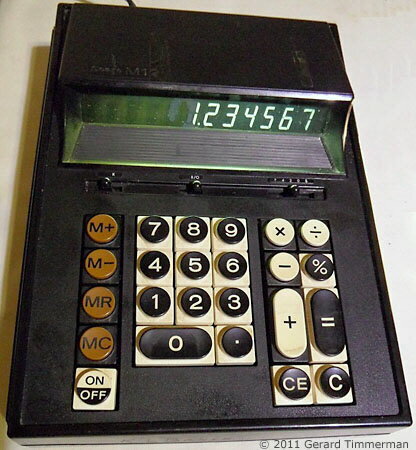 Calculator models manufactured by Rockwell for other companies were the first calculators with a Liquid Crystal Display (LCD) to go on sale (see also the Lloyds Accumatic 100 hand-held model). Due to the reflective nature of the numerals of this first generation LCD a filiament lamp is used to illuminate the display from above it. The lamp has a high current consumption requiring the use of four large D cells, though rechargeable ones can be used. This negates the main advantage of the low power consumption of the LCD. Other slightly later models (eg. Sharp EL-8001) used a hood over the display with a diffusing window to illuminate the numbers of the display. The introduction of LCDs in calculators was not smooth. There was much debate about the life expectancy of the Liquid Crystal compounds used in these displays (though this example worked perfectly after 30 years) and there appear to have been manufacturing problems. It was to be 3 or 4 years before LCD technology had improved and cost dropped for it to start becoming the dominant display technology of calculators. See the article "Liquid Crystal Display (LCD) Calculators" on this site for information about other early LCD calculators. "The EI Ticker", September 1972, p85.